The BHS Next Available Battery (NAB-2000) is an advanced, fully-adaptive monitoring and display system for use with industrial lead-acid battery chargers. The system may be connected to battery charging systems ranging in size from 10 to 500 chargers. 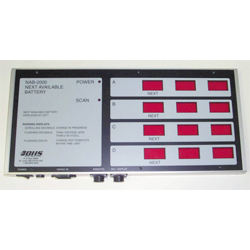 By monitoring the charge status of each battery, the NAB-2000 provides a concise, single-point display of battery status information. This at-a-glance information makes it possible to keep track of all the batteries in your facility, which takes the guesswork out of change-outs. The NAB 2000 uses First In, First Out battery tracking to direct users to the battery which is most fully charged. The system also alerts managers of errors in the charging process (like chargers that haven’t turned on) which can save time and money. Make your battery room more efficient with the NAB 2000. Contact our sales team at +1 314 423 2075 to learn more about Battery Fleet Management products or to find a local dealer.